Much has been said, sung, and written about the natural beauty of the Lone Star State, but such odes have typically focused on the prairie sky, the sagebrush, the bluebonnets, and other things you’d see above ground. Because of that, you might be surprised to find that Texas has just as many majestic and fascinating subterranean sights like those at the incredible Natural Bridge Caverns in San Antonio. Since opening to the public in 1964, the site has become one of premier natural attractions in Texas, offering equal parts amazement, excitement, discovery, and fun. There are several ways for you to experience the wonders of this Texas show cave for yourself. 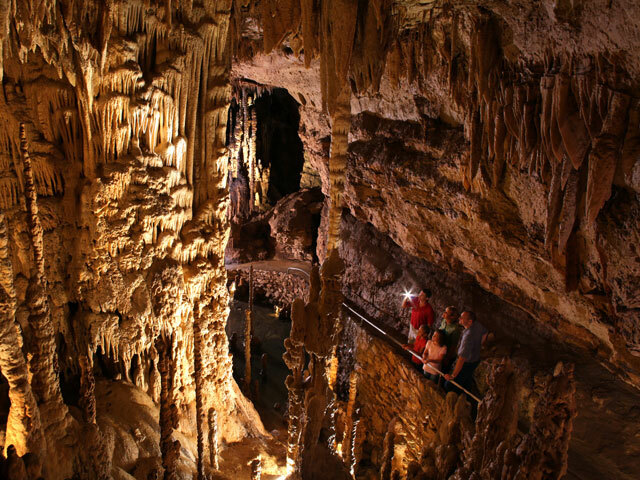 The original and most popular excursion is the Discovery Tour: a half-mile trek 180 feet below ground past stalactites and stalagmites, chandeliers, and flowstones. Early risers can catch the Lantern Tour, journeying down the Discovery Tour path with only a lantern to guide your way. “Soda straws” and “welt and turnip shields” are the breath-taking stars of the Hidden Passages Tour, the caverns’ other world-class, highly decorated cave. No matter what experience you opt for, you’ll be greeted by the 60-foot limestone bridge at the cave’s entrance that the caverns were named after. To really get a feeling of what it was like to be one of the cave’s discoverers, reserve a spot on an Adventure Tour. You’ll exchange concrete walks and handrails for carabiners and headlamps as your experienced guides lead you on a hiking and rappelling tour of the natural caverns. On your three-hour trip, you’ll crawl over, slide down, squeeze between, and climb these awe-inspiring rock formations for a truly unforgettable experience. While there is plenty to keep you busy below ground, that’s not all there is to do here. Climb over 47 obstacles to the top of the 60-foot-tall Canopy Explorer adventure course. Then take in a stunning view of the surrounding Texas Hill Country as you glide on the zip lines of Canopy Zip Lines. Little adventurers are welcome on the Canopy Kids course designed to cater to children and toddlers. Kids will also love taking a turn as a prospector at the Discovery Village Mining Co. Here they’ll sift through “mining rough” with the aid of water from a sluice in search of various gems and minerals before using an identification chart to determine what they’ve found. Kids of all ages will enjoy matching wits with the site’s extensive maze in the AMAZEn’ Ranch Roundup. As any cave-diver knows, spelunking is hard work. When your group has worked up an appetite, head to the Cavern Cafe in the Visitor Center for burgers and pizza, or to the old-fashioned general store Big Daddy's Sweets, Treats and Brew for candy, ice cream, and grown-up beverages. Don’t forget to explore the Discovery Village Trading Post before you go. The trading post stocks jewelry, artwork, geodes, fossils, and other souvenirs of your time at this extraordinary place that’s truly deep in the heart of Texas. With its astounding beauty and the number of ways to experience it, Natural Bridge Caverns is an attraction in San Antonio that you can’t miss during your visit to the Alamo City.